If you’re using iPad’s Maps at Point A and want to get to Point B, Calcutta, Des Moines, or wherever, you need to know how to find any location other than your current location using Maps. Doing this involves entering as much information as you have about the location’s address in the Search field. With Maps open, tap in the Search field. If you don’t see the Search field in the upper-right corner, you may have to tap the Clear button. The keyboard opens (as shown). Type a location, using a street address with city and state, a stored contact name, or a destination, such as Empire State Building or Detroit airport. Maps may make suggestions as you type if it finds any logical matches. 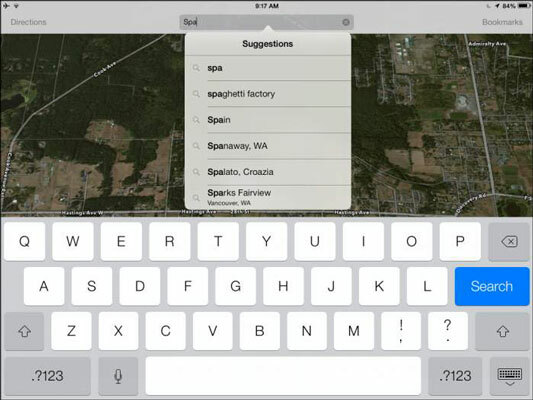 Tap the Dictation key (not available on iPad 2) on the onscreen keyboard and speak a location to iPad if you prefer. Tap in the Search field, and then tap the Dictation key and say the location; tap the Dictation key or in the Search field again and what you’ve spoken appears there. Double-tap the Home button and ask Siri (third-generation iPad or later) for a type of business or location by zip code. For example, if you crave something with pepperoni, say “Find pizza in 99208 zip code.” The results typically display a small map that you can tap to open the Maps app to find your way there. 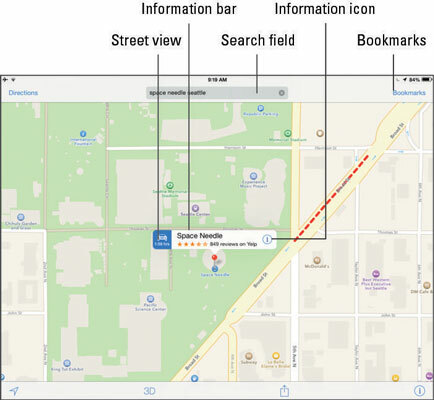 The location appears with a red pin inserted in it and a label with the location and an Information icon (shown here). Tap the Information icon to see more about the destination. Note that if several locations match your search term, you may see several pins displayed in a Suggestions list. You can also tap the screen and drag in any direction to move to a nearby location. Tap the Bookmark icon (the little book symbol to the right of the Search field) and then tap the Recent tab to reveal recently visited sites. Tap a bookmark to go there. You can also quickly go to any location you’ve previously visited and saved using the Bookmarks feature. Add the city and state, if you know them, whenever you enter a destination. A search for Bronx Zoo landed me in the Woodland Park Zoo in Tacoma, Washington, because the search uses the individual words and the closest geographical location for a Zoo match to find results!